You’ve probably seen the Farmer’s Walk being performed by giants in World’s Strongest Man competitions! This exercise is a great for switching up your routine and trying something new and interesting. 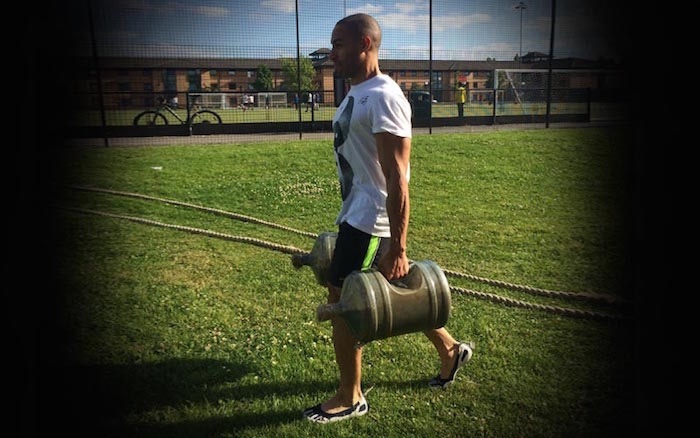 The farmer’s walk can be added to any regular exercise plan, all you need is something heavy to pick up and carry! The Farmer’s Walk is essentially lifting a weight then carrying that weight over a set distance. This is one of the most basic exercises which can help to improve strength training performance. The main thing to focus on is maintaining good posture with a straight spine by bracing your core and controlling your breathing. Performing the farmer’s walk with correct posture is important to avoid over-stressing your joints and muscles. Avoid slumping or curving the spine forward and stabilise the shoulders by keeping the shoulder blades pulled back and down. Keep your abs tight throughout to support your spine and protect the lower back from injury. To prevent your abs from relaxing, breathe as though you were sipping through a straw. Chalk can be used to help you keep a strong grip during the farmer’s walk and beginners carrying lighter loads generally will not need straps. If the total weight carried is greater than your own body weight then you should consider using straps. This can help to protect your tendons from injury as well as preventing your grip from failing well before your other muscles get worked. What Muscles Get Worked by the Farmer’s Walk? The Farmer’s Walk can be considered a full-body exercise as it works muscles from head to toe. The forearms work hard to hold onto the weight whilst the biceps and triceps are constantly working to stabilize the elbow joint. The back and traps will get a serious workout as they support the upper body and prevent slouching. The lower body muscles are literally the foundation for the Farmer’s Walk. Whilst performing this exercise, your leg muscles are constantly being worked. The Farmer’s Walk targets the quads, hamstrings, glutes and calf muscles. The first thing to decide is whether you will walk with light weight for a long distance or with heavy weight for a short distance. It all depends on if the focus is on cardiovascular exercise that will burn fat or strength training. This decision boils down to personal preference and what your goals are. Standard – Lift one heavy object in each hand and walk. Single Carry – Lift a heavy object in one hand only and walk, alternating arms. Barbell Carry – Deadlift a barbell and walk. Overhead Dumbbell Lockout – Lockout two dumbbells overhead and walk. Overhead Barbell Lockout – Lockout a barbell overhead and walk. Waiter’s Walk – Lift one dumbbell or kettlebell overhead and walk, alternating arms. Jug Walk – Bear-hug a large object such as a water jug, keg or tree stump and walk. Trap Bar Walk – Stand inside a trap bar, gripping the handles and walk. If the farmer’s walk is a main exercise in your workout, try 5 sets of 30 steps going one way and 30 steps back. A more difficult workout can involve walking up an inclined surface. You can increase the difficulty by adding extra weight, performing more difficult variations or increasing the distance walked. If you are adding in Farmer’s Walks to supplement another workout day, one or two sets of Farmer’s Walks set can be added to the end of your workout. Try pairing a standard walk with a push day, a single arm walk with a pull day and an uneven walk with a leg day.